Ben Ruben and Mark Hanson – Listening Post, originally uploaded by whh. One of the most engaging works I’ve ever lingered in front of was Mark Hansen and Ben Ruben’s Listening Post, which I saw at the Skirball Center about a year and a half ago (it was first shown in December 2001.) Hansen is a statistician; Ruben is an artist who works with sound and installations. 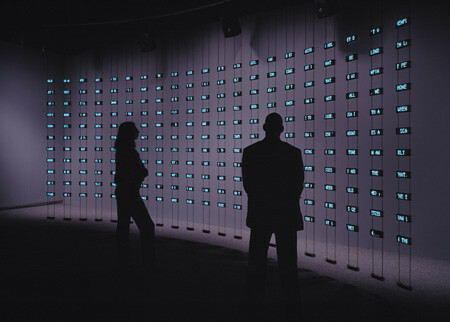 The work organizes data culled from a range of chat channels throughout the internet onto a grid of index-card sized LCD screens, parsing them semantically in a fugue of investigations of simple phrases, run through a voice synthesizer and algorithmically generated into a composition. This sounds dry and experimental: however, when the system looks for every instance of a phrase that begins “i love” or “i am” and stitches them together, the effect is profoundly moving, an exploration of the mass sub-conscious of the Internet. I have rarely been as shaken by a new media work. It reminds me somewhat of the opera of Robert Ashley, but I find it less solipsistic than Ashley’s work. In their statement they elaborate on the process that they used. There are some videos that give a sense of the delicacy of feeling of the work. I hope that it gets shown again soon – it deserves a permanent home.